Macomb Community College strives to be an accepting environment for all members of our learning community, regardless of sexual orientation, gender identity or gender expression. SAFE @ Macomb is Macomb Community College’s “safe space” program. The purpose of the program is to make the College community safer and more inclusive for lesbian, gay, bisexual and transgender (LGBT) students and employees. The program will develop a network of allies through education, awareness, and advocacy. The SAFE at Macomb symbol is a message to LGBT people that allies are understanding, supportive, and trustworthy. 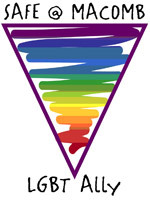 Allies commit to challenging homophobic and heterosexist language and actions in a respectful and informative manner. How can I identify LGBT allies? SAFE @ Macomb allies are College employees who have completed training. Upon successful completion of the training, allies are given a button or placard with the SAFE @ MACOMB logo to display in their classrooms or workstations. Allies at Macomb support and agree with the above mission statement. Furthermore, they strongly feel that students and employees of Macomb Community College have a right to learn and work in an environment in which they feel safe and can be themselves.